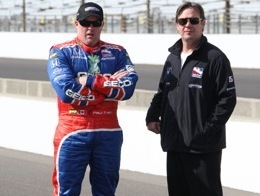 Paul Tracy and his team owner, Jimmy Vasser have a lot to race for on Sunday. Which begs this carrot question…if PT does win the 93rd edition of “The Greatest Spectacle in Racing,” will he hold up one finger or two in Victory Circle at Indianapolis Motor Speedway? While Tracy remains steadfast that he won the 86th edition of the Indy 500 on May 26, 2002, the Canadian has not been whacking people over the head with it during his return to IMS after a seven-year hiatus. After qualifying 13th in the 33-car field on May 10, Tracy has run a limited and quiet Month of May in the No. 15 GEICO/KV Racing Technology Dallara/Honda co-owned by Jimmy Vasser and Kevin Kalkhoven. Tracy said Vasser, the 1996 CART champion, made the offer this week to drive in Round 5 of the IndyCar Series at The Milwaukee Mile on May 31. Tracy tuned-up for his sixth Indy 500 – and first start of the 2009 schedule – during Friday’s Carburetion Day practice with a trouble-free, one-hour session. “For sure, we’re ready,” said Tracy, who has yet to lead any of the 618 race-day laps he has completed around the 2.5-mile IMS oval. “The GEICO car is handling great. We did some pit stop practice and everything’s good, so we’ve just got another day to wait. We did a few setup changes during practice. I wasn’t too happy with it to start out, but we got it better at the end. Tracy’s fifth Indy 500 start ended with a broken heart in ‘02. Racing on Lap 199 of the scheduled 200, Tracy attempted to pass Castroneves for the lead in Turn 3. Simultaneously, a crash involving rookie Laurent Redon and 1996 Indy 500 champion Buddy Lazier in Turn 2 brought out the day’s fifth and final caution flag. Indy Racing League officials ruled the yellow came out before Tracy completed the pass, making Castroneves the winner. Tracy claimed the opposite. Team Green dutifully filed a protest on Tracy’s behalf with IRL officials. Castroneves’ second consecutive victory at IMS was not confirmed until July 2, 2002, following the protest, a denial by IRL officials, an appeals hearing and an 18-page decision delivered by IRL founder Tony George. The victory of Castroneves and Team Penske, fulltime members of the IndyCar Series, over CART interlopers Tracy and Team Green was perhaps the last political salvo fired in the IRL-CART feud that had raged since the 1996 season. Tracy, who vowed after the 2002 decision never to return to IMS, landed this ride last month. And he has been fast at IMS since the opening day of practice with the rookie class on May 5. Among those who have taken note is Dario Franchitti, one of Tracy’s Team Green teammates here in 2002. Franchitti, the 2007 Indy 500 winner and series champion with Andretti Green Racing, is among the pre-race favorites starting on the outside of the three-car front row in his new ride with Target Chip Ganassi Racing. But the Scotsman likes what he has seen out of his old running mate. In addition to Vasser’s promise, Tracy learned this week that KVRT will field a car for him at the two Canadian races on the series schedule this summer.Tracy will compete at the Honda Indy Toronto on July 12 and the Rexall Edmonton Indy on July 26. Tracy said he is cool with that, although he continues to struggle with the reality that the merger of IndyCar and the Champ Car World Series last year left him without a fulltime ride. During a span of 18 seasons, Tracy has posted 31 victories, 102 top-five finishes and 25 poles. In his only start of the 2008 season, Tracy finished fourth at Edmonton while driving for Vision Racing – the team owned by the IRL’s George. “It bothers me sometimes but you have to look at the whole picture,” said Tracy, the 2003 Champ Car Champion. “These cars don’t run without dollars behind them. The top teams – Ganassi and Penske and Newman/Haas and Andretti Green – they’re set, the drivers, with long-term contracts. To get into one of those cars, you have to wait for a contract to open up. And with the way the economy is, everything fell apart over the winter financially for a lot of people…people’s investments went bad…I know my portfolio is down 20 percent of what it was. Furthermore, Tracy said he truly is at peace with being back at IMS.